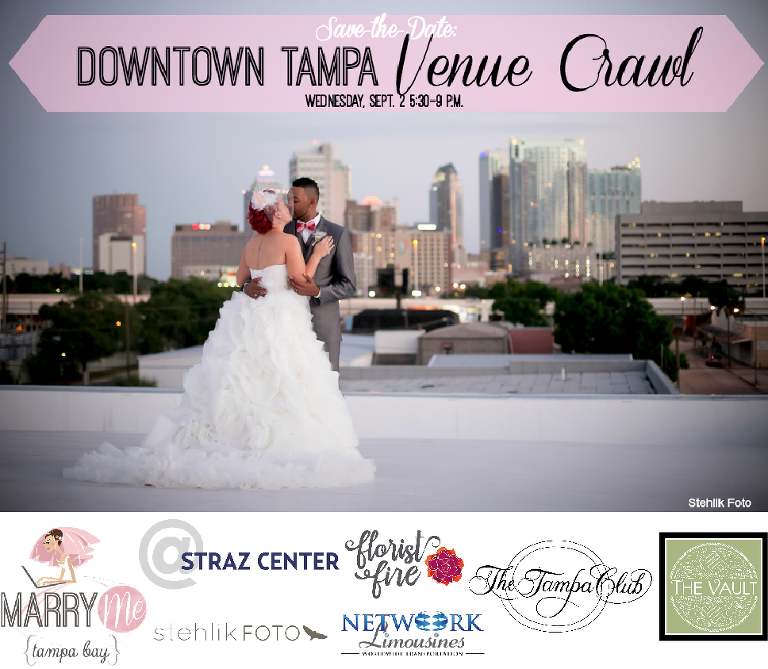 So to streamline networking and venue visits, Marry Me Tampa Bay has created a venue crawl for wedding vendors! You’ve probably heard of a pub crawl, where you visit various bars and sample their drinks. Well, our venue crawl is along the same lines. You’ll have the opportunity to visit three amazing wedding venues, meet the coordinators, network with top wedding pros and of course have yummy bites and drinks along the way! We’ve teamed up with Marry Me Tampa Bay preferred venues, The Tampa Club, The Vault and the Straz Center for the Performing Arts to kick off our first crawl. Get a bird’s eye view atop the Bank of America building at the Tampa Club, go inside an actual bank safe at the Vault and step on stage where hundreds of stars have performed at the Straz Center. Network Limousines will be toting us around town in their newest stretch, while Stelik Foto captures all of the fun. Limited spots available. Late registration ends August 31st!